Muslims in Telangana, who constitute around 12.7% percent of the electorate, are expected to decide the destiny of political parties in at least 40% of the 119 assembly constituencies the state that goes to the polls on December 7, say political experts. Muslims are present in considerable numbers in almost all districts of Telangana but are predominant in Hyderabad, Ranga Reddy, Mahabubnagar, Nalgonda, Medak, Nizamabad, and Karimnagar districts. According to the Telangana Social Development Report- 2017, 1.73 million Muslims reside in Hyderabad alone, making up a fourth of the city’s population and 43.5% of the state’s Muslim population. The city has 24 assembly seats, of which the outcome in 10 can be influenced by Muslim voters. Most of the Muslims of Hyderabad are residing in the old city, which has been a fiefdom of the All India Majlis-e-Ittehadul Muslimeen (AIMIM) for two decades. The party has been consistently winning all the seven assembly seats in the old city. The Asaduddin Owaisi-led All India Majlis-e-Ittehadul Muslimeen (AIMIM) expects to increase its influence beyond the Muslim strongholds in Hyderabad. Political analysts believe the AIMIM, which is on “friendly” terms with the Telangana Rashtra Samithi (TRS), will help the latter win some seats through tactical posturing, thereby weaning away crucial Muslim votes away from the Congress. If that happens, then it will mark a generational shift of minority votes from the Congress. The MIM was a strong opponent of the bifurcation of Andhra Pradesh before 2014, fearing that it would result in the growth of the Bharatiya Janata Party (BJP) in Telangana due to a polarisation of Hindu votes. However, with the Telangana Rashtra Samithi (TRS) emerging stronger after the formation of the new state, the MIM gave up its anti-Telangana stand and warmed up to the TRS. In September, MIM president Asaduddin Owaisi appealed to Muslims voters to opt for the TRS in the constituencies outside Hyderabad where his party is not contesting (seats such as Asifabad, Mahbubnagar, and Medak). “Owaisi’s party has gained a considerable hold over the Muslim voters across the state. This has turned out to be an advantage for the TRS headed by K Chandrashekar Rao over the other Congress and its allies,” says a political analyst and Muslim scholar Mir Ayub Ali Khan. 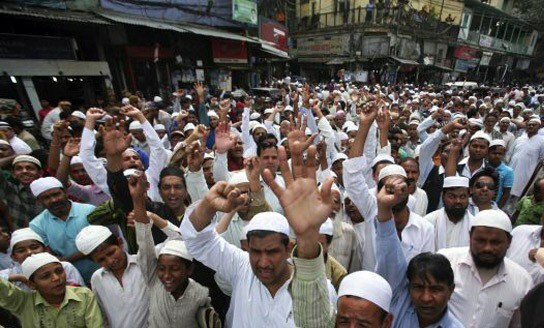 “The Muslims have lost faith on the Congress after the Babri demolition. It has failed to prevent the growth of the BJP. On the other hand, the TRS has been able to provide a secure environment for the Muslims,” a senior MIM leader told the Hindustan Times. “The biggest benefit KCR has done for the Muslims is the establishment of 200 residential schools and colleges exclusively for Muslims, where they are given free education, food, and clothing up to Class 12,” said Khan. Out of the 119 seats in the assembly, 24 falls under the Greater Hyderabad area (core city and surrounding places), of which seven are considered to be the bastions of the AIMIM. In the forthcoming polls, the Congress, Telugu Desam Party, Communist Party of India and Telangana Jana Samithi have joined hands to form an alliance against the TRS, which had won 63 of the 119 seats in the 2014 polls (it later had about 90 MLAs due to defections), with the rest being split between opposition parties. “The AIMIM has pledged its support to the TRS and this will be a decisive factor in the elections. It will do everything possible to ensure Muslim votes across Telangana gravitate towards TRS, which is likely to result in non-consolidation of an anti-BJP vote in favor of the Congress party. The TRS’s confidence of winning 100 seats also comes from this support,” said Palwai Raghavendra Reddy, a political analyst. TRS supremo and present caretaker chief minister K. Chandrashekar Rao dissolved the assembly on 6 September, citing “political fragility”, thereby advancing the polls, which were originally scheduled to be held in the summer of 2019. Last week, the Election Commission of India announced that polls will be held on 7 December and that the result will be announced on 11 December. KCR’s son and state IT minister KT Rama Rao said Muslims were feeling secure during the TRS regime. “There was not a single instance of communal violence in Telangana. Old city of Hyderabad which used to witness curfews regularly during the Congress regime is peaceful now. The Muslims are happy with TRS,” he said at a meeting in Wanaparthy early this week. Be the first to comment on "Muslims votes will play a crucial role in the forthcoming Telangana state elections"